n the wake of several proposals to redevelop historic sites and bare lots downtown, not all developers have committed to beginning construction this summer. From a six-story highrise at the historic North Fourth Street Lyons Garage site to a new multi-use building on an empty lot off of DeMers Avenue, the city has recently reported its downtown is slated to experience a “billion-dollar boom” in investments. As for Selkirk’s first two floors of commercial space, Ritterman said he’s had some interest but no committed tenants. “We’re open to all types of businesses,” he said. Ritterman said he plans to begin construction on another multi-use development on the corner of DeMers Avenue and North Fifth Street. The $10.5 million Pure Development will offer 50 residential units for rent, a Hugo’s grocery store and a drive-up Alerus Bank site. Ritterman said he plans to have the entire building ready by summer of 2020. The project isn’t expected to close any nearby streets. “It’s a little bigger site to work from than Selkirk,” Ritterman said. 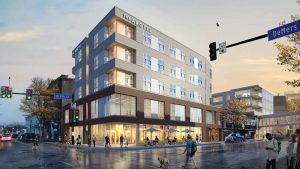 Developers for other downtown projects have said they need more time to finalize plans and attract tenants. That includes a project from JLG Architects called the “Argyle,” on Fourth Street and DeMers Avenue. “We’re kind of just right now trying to develop two projects that we’ve got out on the south end,” said Miskavige, whose company will begin constructing a 160-unit apartment complex on South Washington this summer. Northridge is also helping build a recently announced senior living facility from Edgewood.